I followed instructions given in the Non Electric Lighting series, on how to make this vegetable oil lamp. What got me interested in trying this out was, all the materials are items most people have readily available at home. 1. Fill the jar with table salt. 2. Add vegetable oil and mix well with the salt. Let it settle down. 3. Add a bit more vegetable oil after it settles. 4. Wrap a wooden toothpick with the cotton from end to end. Do not skimp on cotton but don’t make it too thick either. 5. Stick the cotton wrapped toothpick in the vegetable oil/sand mixture. If it is too tall for the jar, snip the end until the tip is level with the mouth of the jar. 6. Drop a tiny amount of nail polish remover on the tip of the cotton wrapped toothpick. Take care not to spill into the vegetable oil. You’re done! This homemade lamp will burn for about two hours. On my first attempt I had used recycled cotton from a pill bottle which may not have been 100% cotton. The next time, I made sure it was 100% cotton. I also had not wrapped the toothpick well enough and had a few gaps that weren’t covered with cotton. This time around, I wrapped the toothpick until it was completely covered with cotton, but not overly thick. Sure enough, it worked very well. This experience showed me that even though you have instructions on how to do something, there are unforeseen variables that may hamper your success. 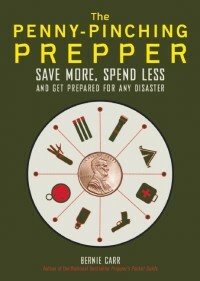 You need to test your knowledge and practice your preparedness skills. The time to practice new skills is now — not when an emergency is in full swing and the power is already out. Oh thanks for this. We are getting ready to move into an RV and this will come in handy when the power goes out or we are boondocking. I’m torn on this one. It may be useful now in a pinch or as a novelty with the kids. Perhaps you’re in a unique position in a crisis scenario where the ingrediants are abundant. I feel that salt and oil will be far more important for curing or consumption. Like I said, maybe in pinch when light is critical. Still very nice to know though. Load up on cheap tealights while you can! Hi Archer, Sand can be used instead of salt, in case that is more plentiful. Thanks for the comment! I wanted to call your attention to another fabulous DIY candle: the “button lamp” that Ma Ingalls makes in “The Long Winter,” one of the novels (I like to call them “novelized memoirs” because they are based in truth) by Laura Ingalls Wilder. “The Long Winter” was the least “fictionalized” of Laura’s recollections when she began writing her life story in novel format in her 60s. In the book the family is sheltering in Pa’s store, living in the back/upstairs, as was common in 19th century stores. The family moved to town from their claim shanty in the South Dakota prairie, in order to better their chances of winter survival. All the kerosene is gone, there is no coal, the trains are not running, and the family is stuck with what food they have, along with what other resources they have. They have run out of light sources at the point that Ma makes the button lamp. They get stuck from November to April in near-continuous blizzard conditions, with the deep snow and ice pack preventing trains from reaching the town (De Smet, SD townsite). The book is awesome, my favorite in the series. The button lamp was constructed from a little bit of fat, in a tin with a button floating in the fat. The button had a piece of cotton cloth tied around it, the corners twisted together to form a wick. The cloth slowly absorbed the oil as the tip burned, creating a long-burning source of (very, very meager) light and heat. Hi thornfield, That button lamp sounds really creative. I should read the series, sounds like we can all pick up some good ideas. Thanks for the comment!